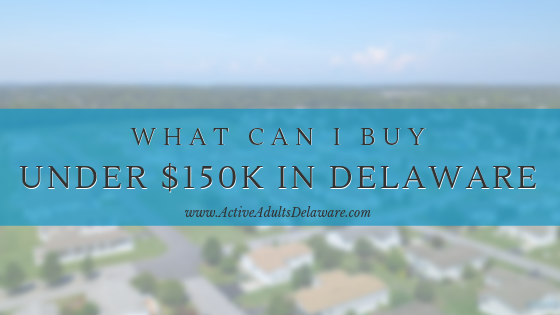 Are there any homes for sale in a Delaware 55+ community for less than $150K? Each community is different plus what is included in the rent payment will vary. As an example, I’ll use Sussex West in Lewes, Delaware. Many of our clients over the years have purchased a home in Sussex West and our agents are very familiar with the community. HOA Membership is an additional $25/year which is optional. Pool membership for the new indoor pool is $120/year or $30/quarter. So, if you participate fully in the community, on an annual basis your lot rent plus pool membership would range from $6,000 to $7,500 per year. Another community in Magnolia, Southern Meadow, has a very similar structure and comparable land lease amounts. There are many other leased land communities and mobile home parks, especially in Southern Delaware but not all leases are as simple and straightforward as the ones in Sussex West and Southern Meadow. Make sure to work with a REALTOR®whospecializes in these communities to avoid surprises down the road. That is a different business. One advantage of living in a land lease community is you do not pay property taxes on the homesite. You pay only taxes on what you own! Since the landlord owns the land, you are responsible only for the property taxes on the home itself. If you were to compare the same home on leased land versus a lot/home package, you will quickly find discover it will cost at least another $100,000 or more to own the land and the home. For many people, this is prohibitive, so the opportunity to buy a nice home in a good location in a leased land community is good news. You may not be able to obtain a mortgage on this type of property since it is qualified as personal property instead of real property. The best idea is to pay cash for the home, put that money you saved by not buying the homesite in a bank account, and budget for the monthly lot rent payment. You will need to apply first to the community, just as you would to rent an apartment or home, and agree to a credit check and background check. There are advantages to living in a land lease community. And, with the variety of communities we have in Delaware, there truly is something for everyone. Watch our video, What Can I Buy for $150k or Less? Thank you Patricia; I made the correction!